As iOS 7 has finally been unleashed to the masses, lots of little details about the new operating system are starting to surface. One major one that MacRumors has caught wind of is that Apple increased the over-the-air download limit from the previous 50MB to 100MB. This means that you’ll be able to download new apps and update apps over cellular service as long as they aren’t over the 100MB threshold. 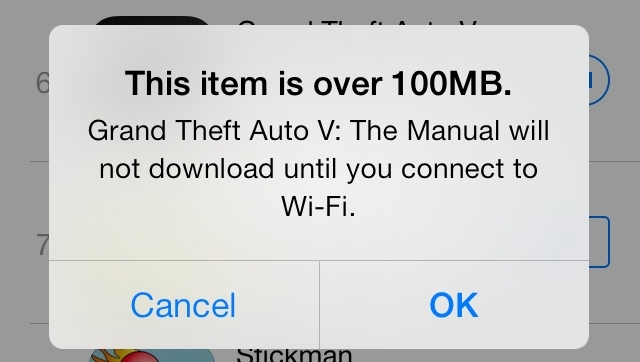 If memory serves correctly, the original cellular download limit started off as 10MB when the App Store was first opened in mid-2008, but was increased to 20MB as many apps and games couldn’t squeeze into that original 10MB limit. As years have gone by, games and apps have only become even more robust, especially with the addition of high resolution screens starting with the iPhone 4 and spilling over to the iPad side of things with the iPad 3. Those high resolution assets aren’t small, and if you toss in the fact that a game or app might be Universal, then the app has to contain those assets for both the iPhone and iPad versions all in one, increasing its size even more. As a result, Apple increased the limit once again just last year to 50MB, but it still wasn’t quite enough for many apps and games. Lots of times developers have “cheated" around the 50MB limit by offering up a low-res version of their app which is what gets downloaded to your device, but upon launching it the game would then connect online and download a set of higher resolution assets. This could result in a wait time when first launching a new app or game, and in the mobile world where we expect instant gratification, could be an annoyance. With today’s new increase to 100MB, it should solve that problem for a good portion of today’s apps that were struggling to slide in under that 50MB threshold. Of course as hardware and software both improve as they have over the last five years, even 100MB likely won’t be enough given enough time, but it’s definitely a welcome improvement along with all the other new stuff in iOS 7.